Was it an open crossing? 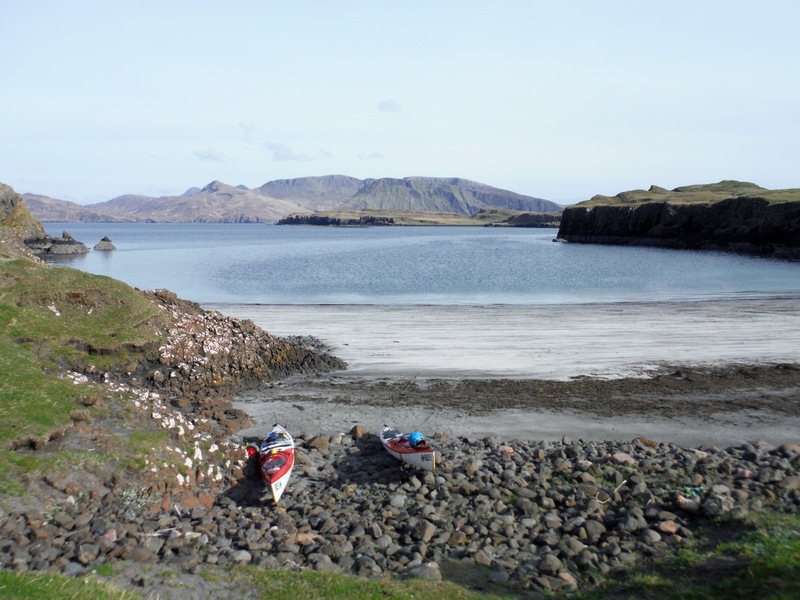 Canna promised to be an interesting island with rugged coastline, beaches and the adjoining island Sanday with its church, school and most of the community there. However, we had the weather window before the gales would come and were eager to make a move. Dinner at Canna Cafe was accompanied by charts and Almanac. The tides were defined, weather checked and the bearing taken, 320 degrees. At 6.30am we got up, at 9am we launched with estimated 10 hours ahead of us. I have asked that question to Michal as I honestly wasn’t sure. We could see where we wanted to go in the distance, the highest peak, the Hecla on South Uist. To the left of us we had nothing but open sea, yet from previous days we knew that the isle of Coll and the Heiskeir lighthouse are there. To the right we had the isle of Skye running along us for most of the way uncovering more and more of its headlands. Was it boring? Not really. Such long paddles across vast amounts of water require the right mind setting. What’s important to know from the start is, that if it is estimated 10 hours, it won’t become less, rather more. Along the way, there’s always something happening. At the start the sea was quite rough, so not much time to think about other stuff than staying afloat. 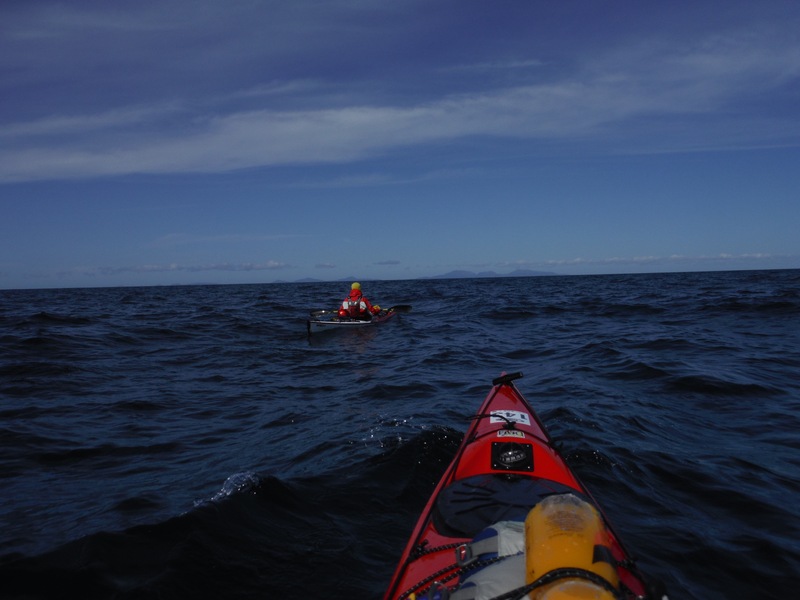 Then the headwind started, so most energy was invested into right paddling, stroke after stroke, because if the body gets hurt at the beginning of the distance, it’s either a turn back or agony till the end. When the conditions were against us, it was hard to stop, as it meant loosing gained, yet snack were welcomed distraction from the stroke after stroke after stroke routine. The perception of the time and distance gets very distort. Very often after a slow moving the routine one suddenly realises that ten miles were gone or that one has paddled for three hours rather than just two. Also it is no point deciding to postpone a break till 4pm, if one wants it at 3.30pm, that doesn’t help and the time starts to crawl and the paddling becomes a chore. Better take it there and then. We didn’t take long stops on this crossing, 5 minutes maximum. The only ones that were longer and caused some entertainment were pee stops. While Michal’s were usually straightforward, mine were always a betting game. There’s no point in counting hours, it doesn’t make it any faster, it was much better to look around. Every new thing to see provided a great stimulus, a boat in a distance crossing our path in a faraway shipping channel, different birds rocking on waves flying away or diving in as we approached. 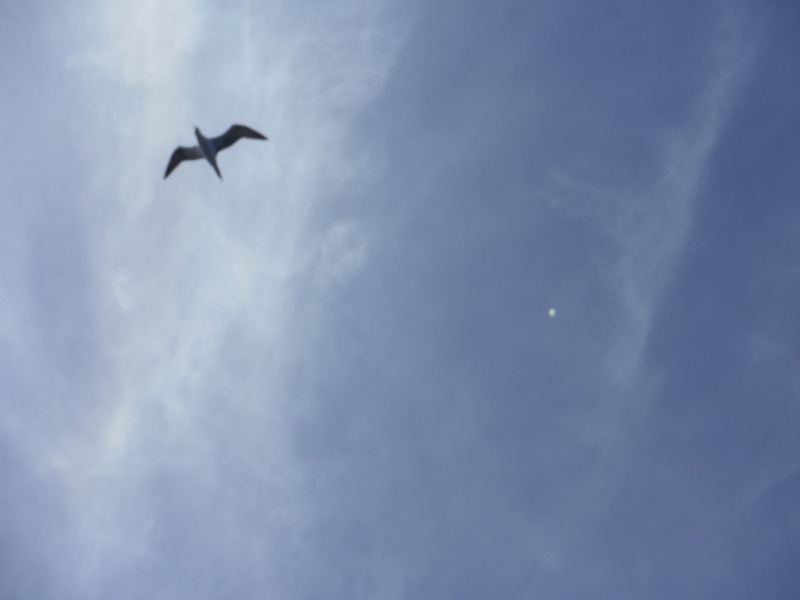 For a while the gannets were circling, flying quite low above our heads. A dolphin decided to look closer at us and shown us his tail fin. The water changed colours. Later the wind dropped and the sea calmed, the reflection of my fellow paddler became a great movie, too. The last two hours were the most challenging, the land was now all around us, yet still quite far. Here our patience had to be the greatest. We got so far, we would get to the shore as well. 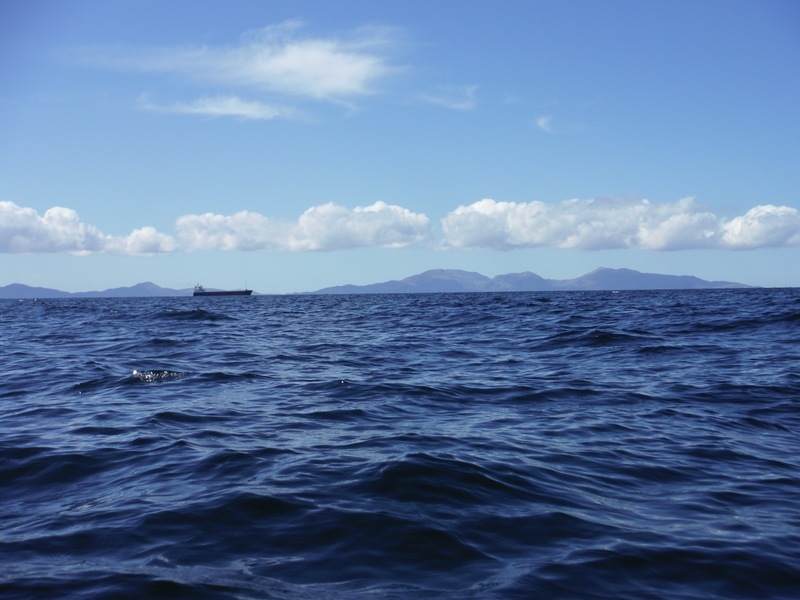 Some buoys started to appear in the distance between us and the land, so I engaged in a game of sprinting from one to the next one, as I needed to see something being left behind what wasn’t Canna. Finally we were there or here in Uisinish Bay at South Uist, 10,5 hours after departure. Unfortunately the hard work hasn’t finished yet, the boats need to be landed, and the body needed to get accustomed to different movement.